Western Canada is blessed with some of the most incredible scenery on the planet, and every summer international visitors flock to Alberta and British Columbia in search of the crystal clear lakes, snow-capped mountains and glacial valleys that scream "Canada" from the postcard stands. ...but I recently discovered a quieter, less expected place to soak in the beauty of the Rockies. Tucked away in the southwest corner of Alberta, almost touching the border of British Columbia is a striking region known as the Crowsnest Pass. It's about a 2 hour drive from Calgary, but even with the Stampede drawing record crowds this year, the tourist rumble wasn't felt in the Crowsnest. The drive south from Calgary is classic Alberta: green and gold fields of wheat and canola roll gently towards the foothills of the Rockies, which quickly give way to the jagged peaks and slate grey slopes of the young mountain chain. Horses and cattle dot the landscape, along with all the cowboys and girls who didn't make the trip to the Stampede this year. 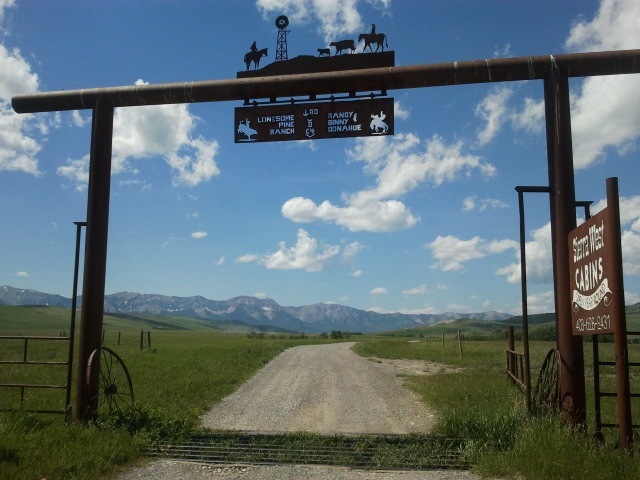 We stayed at a working cattle ranch called "Sierra West" about a half-hour from the heart of the Crowsnest Pass. The ranch has been in the family for several generations and the rustic log cabin we slept in was once the sleeping quarters of an early 20th century farmhand bachelor. Being in the area for a trail running race, we didn't take the owners up on their kind horse-riding offer, but saw several other guests trying their hand at being cow-pokes in the shadow of the Rockies. The 148km race started in the small town of Blairmore and took our team of seven runners on an intimate tour of the local landscape. We got to climb up Crowsnest Mountain and wind around the Seven Sisters, run across the infamous Frank Slide (a field of boulders that buried the mining town of Frank 109 years ago) and take in stunning views of the Continental Divide. When not running, we could enjoy the charms of Blairmore, which included antique shops, an old-timey movie theatre and friendly independent coffee shops. Unlike Banff, there wasn't a fudge counter or postcard rack in sight. If you're looking to get a taste for the Wild West, rugged mountain scenery and unspoilt little towns, consider a trip to this often over-looked part of Western Canada. You won't find many Hiltons, but ranch accommodation, cabins and B&Bs abound.